NEW ORLEANS – The U.S. Track & Field and Cross Country Coaches Association (USTFCCCA) announced on Wednesday the winners of USTFCCCA Region Athletes and Coaches of the Year honors for the 2011 cross country season in Division I as voted by the division’s coaches. Indiana State will host the NCAA Division I Cross Country Championships on Monday, November 21, at the LaVern Gibson Championship Course located at the Wabash Valley Family Sports Center in Terre Haute, Ind. The men’s race will begin at approximately 12:08 p.m. ET, followed by the women’s race at approximately 12:58 p.m. A live webcast of the championships will be broadcast from noon to 1:30 p.m. ET on NCAA.com. In addition, highlights from the championships will be included as part of the CBS NCAA Fall Seasonal Show scheduled to air on Saturday, December 18, from 1:00 to 2:00 p.m. ET on CBS HD. 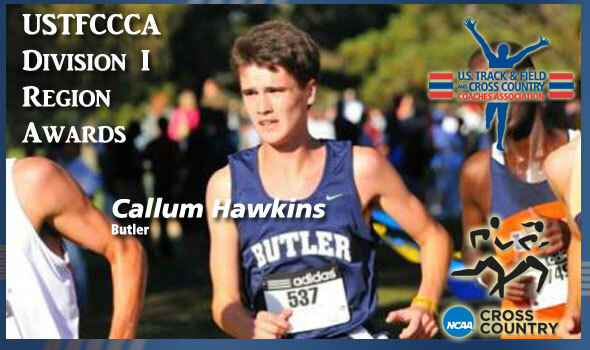 A sophomore from Glasgow, Scotland, won the Great Lakes title by seven seconds with a 30:01 clocking ahead of Cincinnati’s Eric Finan, becoming Butler’s first region champion since 1998. He also won the Horizon League title this fall. Cabral, a senior from Glastonbury, Conn., took the Mid-Atlantic region crown in 30:30, securing an eight-second victory over Villanova’s Ryan Sheridan. Cabral was in 33rd place and 25 seconds behind the leader at the 5k split in the race. Also, Cabral led Princeton to the Ivy League team title through a barrage of wind, sleet, and snow. A senior from Minneapolis, Minn., Mead won the Midwest race by just over five seconds ahead of Oklahoma’s Kevin Schwab for his second career regional title. Mead was fourth at the Big Ten Championships this season as well. Batty, a senior from Sandy, Utah, won the Mountain region race in 30:09, two seconds ahead of Southern Utah’s Cameron Levins. Batty pulled ahead late in the race for the crown. Batty also won the West Coast Conference title in leading the Cougars. Korir, a senior from Iten, Kenya, won the Northeast region by three seconds ahead of Providence’s David McCarthy for his second-straight region win. Korir also won his second-straight MAAC title this fall. A junior from Billinge, England, won the South region over teammate Michael Fout by nearly three seconds. Forester was fifth at the ACC Championships this fall. Lelei, a junior from Kapasbet, Kenya, won the South Central by nearly nine seconds over Arkansas’ Eric Fernandez. Lelei was third at Big 12 Conference meet and was named the league’s newcomer of the year. A senior from Hickory, N.C., Hill won the Southeast by nearly four seconds with a 29:48 run over UNCG’s Paul Chelimo. Hill was this season’s ACC Champion as well. Lalang, a freshman from Eldoret, Kenya won the West in a blazing 10k time of 28:34, 16 seconds ahead of Stanford’s Chris Derrick. Lalang is the winner of five races this season, which includes wins at the Wisconsin adidas meet and Roy Griak Invitational where he set course records. Lalang also was the Pac-12 Champion this season where he set another course record with an eight-second victory. A senior from Manahawkin, N.J., Tauro won the Great Lakes by five seconds with a 20:27.9 clocking. Tauro was also third this year at the Big Ten Championships. A junior from Kapenguria, Kenya, Tuliamuk was the Midwest champion, taking the region’s race in 20:40 – 13 seconds ahead of runner-up Betsy Saina of Iowa State. She was also the Missouri Valley Conference champion this fall. Kimaiyo, a junior from Iten, Kenya, is the Mountain Region’s champion for the second-straight time after registering this year’s victory in 20:35, placing 18 seconds ahead of BYU’s Morgan Haws. She was the Conference USA runner-up this season. A sophomore from Topsfield, Mass., D’Agostino took the Northeast region in 20:25, 14 seconds ahead of Syracuse’s Lauren Penney. She also won the Ivy League title, becoming the first from Dartmouth to win the league crown since 1997. Winslow, a junior from Lawrenceville, Ga., won the South in 20:33 after being clocked in 28th place after the 3k, halfway—point split. She finished one second ahead of teammate Hannah Brooks as part of a 1-2-3 Seminole sweep at the regional meet. Winslow was the runner-up of the ACC Championships. A senior from Orsta, Norway, Fjortoft took the South Central region crown in 19:59.1 in a wire-to-wire victory. The Mustang won the region’s race by more than 26 seconds on the field as part of a six-win, undefeated season. She also led SMU to the Conference USA title with an individual league crown and conference record time. A senior from Craven, Saskatchewan, won the Southeast region crown with a time of 19:52.9, more than 14 seconds ahead of the field. Schaaf also won the ACC title by 25 seconds this fall. Hasay, a junior from Arroyo Grande, Calif., won the West region crown in 19:44, seven seconds ahead of Cal’s Deborah Maier for her second-straight region title. Hasay was third in the Pac-12 race this fall. Byrne’s Badgers won the Great Lakes title for the tenth-straight year this season. Wisconsin won with 50 points, placing their five scorers in an 8-9-10-11-12 bunch to nearest challenger Indiana’s 70. Wisconsin also won their 13th-straight Big Ten title this fall and is the No. 1 team in the country heading into the NCAA Championships. Byrne is in his fourth year at the helm at Wisconsin. The Hoyas won the Mid-Atlantic region, 47-63, over runner-up Villanova by placing four runners in the race’s top eight. For Henner’s squad, it’s the seventh region crown in the last eight years. Georgetown placed second in the Big East this fall for Henner in his 13th year at the school. Smith’s Cowboys have had an undefeated season to this point, taking the region title with a 42-45 victory over Oklahoma in placing runners in slots 3-4-5-6. The second-ranked team in the country also won the Big 12 title for the fourth-straight year for Smith in his sixth year at OSU. The Cougars won the Mountain region by placing their top three runners in the race’s top ten and five in top 16 for a 49-55 victory over runner-up Colorado. BYU also won their first West Coast Conference title this fall. Eyestone is in his 12th year at the helm at BYU. Fox’s squad won the Northeast region crown for the third-year in a row with a 54-72 victory over Iona. The Orange placed their five runners in the top 16. Syracuse was fourth at the Big East Championships for Fox in his seventh year with the group. Braman’s Seminoles won the South region crown by placing their top three runners in the race’s top four for a 40-68 victory over runner-up Florida. The team finished second at the ACC Championships this fall for Braman in his 12th year at FSU. Texas won the South Central region by placing their top five runners in the top 15 for a 40-56 decision over runner-up Texas A&M. The Longhorns placed third at the Big 12 meet this season. Hayes is in this fifth year as distance coach for Texas’ men’s cross country team. Geiger’s guys won the Southeast region by 71 points in placing their top three in the race’s top 15 and all five in the top 25. The team will be making their sixth-straight appearance as a team at the NCAA Championships. NC State also won their 14th ACC title in 21 years this fall for Geiger in this 34th year. Cal Poly placed third in the West region this fall with two runners placing in the race’s top 20, improving from a 12th-place finish a year ago. The Mustangs also won the Big West title this fall for the 11th time in 14 seasons for Conover in his 15th year with the squad. McGuire’s team won the Great Lakes region with a 45-77 win over nearest challenger Michigan State with the top two finishers in the race. The Wolverines were second in the Big Ten this fall for McGuire in his 22nd season. The Wildcats of Villanova tied Georgetown for the Mid-Atlantic region title this fall to hold claim to a region title in each of the last three years. Villanova won the Big East title this fall for the fourth straight time. Procaccio is in her 12th year with the school. The Cyclones of Iowa State won the Midwest region title for the second-straight time by placing their top four in the top 10 of this year’s race. ISU also won their first-ever Big 12 title this fall for Ihmels in his fifth year at the helm. Franklin’s team tied for the Mountain region title with Colorado this fall, placing their top three runners in the race’s top 20. The Lobos also won the Mountain West title for the fourth-straight year. Syracuse won the Northeast region title for the third-straight year by placing their top two in the region’s top ten. The Orange tied for fourth at the Big East Championships for Fox in his seventh year. The Vanderbilt crew placed second in the South region to earn their first-ever berth as a team to the NCAA Championships. In addition, the Commodores won their first-ever SEC title this fall for Keith in his sixth year at the school. Harter’s crew won the South Central region title for the first time since 2008 by placing their five scorers in the race’s top 16 for a 49-69 victory over runner-up Texas. Arkansas was second at this year’s SEC Championships for Harter in his 22nd year at the school. Virginia won the Southeast region for the second-straight year by placing their top three runners in the race’s top 20 for a 107-113 triumph over nearest challenger NC State. UVa placed third at the ACC Championships this fall. Vigilante is in his fourth year at Virginia. Metcalf’s squad won the West region for the fourth-straight year with a 50-98 victory over Arizona. The Huskies placed their top three runners in the top ten and five scorers in the top 15. UW was second at the Pac-12 Championships this fall and Katie Flood won the individual crown. Metcalf is in his tenth year at Washington.